カリフォルニア Here we are...: Thanksgiving Dinner Leftover? My favorite part of Thanksgiving is eating leftover. 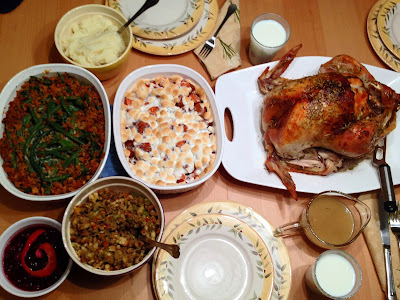 . .
Due to the fact we never host Thanksgiving dinner and make only a side dish and a dessert to take with us to our brother-in law's house, we never end up with the leftover. The problem solved! I made the entire Thanksgiving dinner tonight minus pumpkin pie! Now, we can enjoy the leftover for a few days!! I'm finally happy.